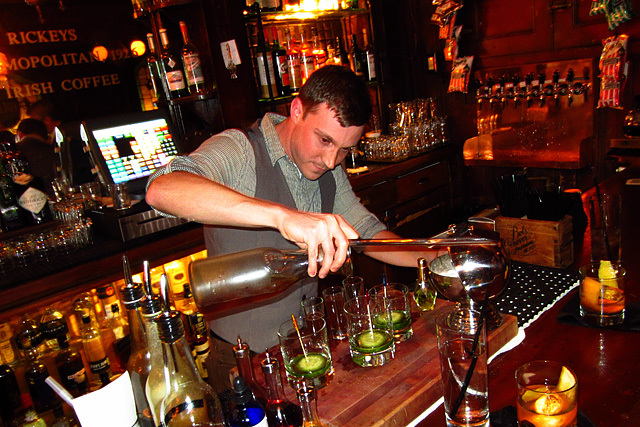 On the night before Repeal Day, The Varnish and Cole’s Red Car Bar hosted the 4th Annual Jimmy Barella Bartending Competition, named for the legendary bartender who worked at the Red Car Bar from 1918 to 1983. 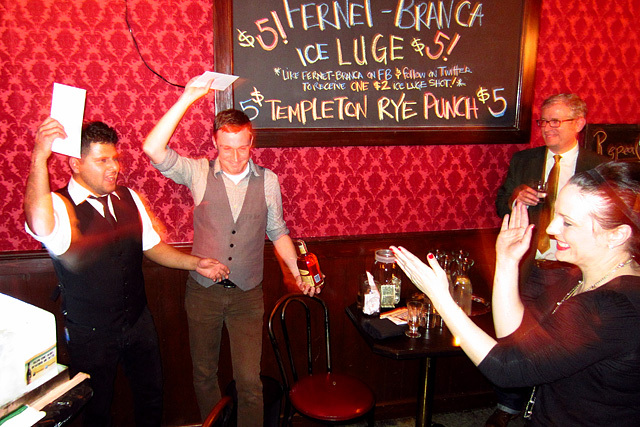 The event was sponsored by Fernet-Branca and Templeton Rye, and featured ten of the best bartenders in Los Angeles competing for a $500 prize. The judges panel, which included Home Bar Basics author Dave Stolte and David Munoz of Infinium Spirits, was faced with the arduous task of judging three rounds of competition, beginning at 2pm. The final round was scheduled for 9pm, and evaluating so many cocktails over the course of several hours was not a job for the faint of heart or weak of liver. The first round was a blind tasting that observed USBG rules, with ten contestants paired off and competing in five heats. In this round, all the bartenders were asked to make the cocktail they had submitted for the competition. The judges would look for taste, presentation and balance. The bartenders made their drinks behind closed doors inside The Varnish, and the judges were served the competing cocktails at their table at Cole’s. 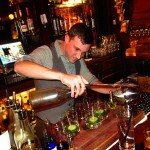 The judges were present for the second round, which featured four bartenders paired off in two heats. Two classic cocktails per heat were drawn for the contestants to make, and judges were able to factor in personality to their scores. After the dust had cleared, Christopher Day (Bar | Kitchen) and Edwin Gomez (Cole’s) had made it to the finals. 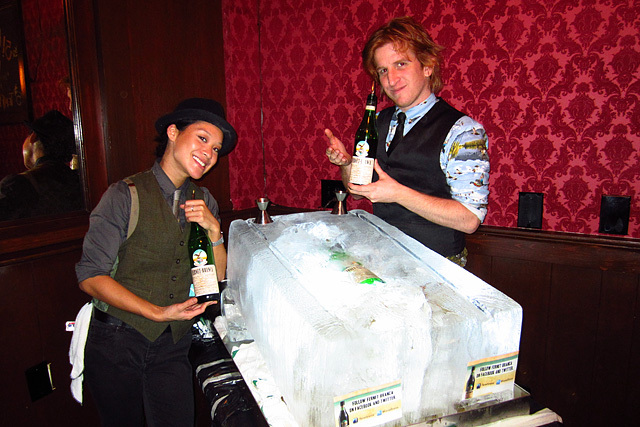 The Repeal Day Eve festivities opened to the public at 6pm, which included Templeton Punch, a jazz band, and the showstopper, a Fernet Ice Luge. For $5 per shot, two guests at a time were seated at one end of the ice slab, then Yvonne Chu and Kevin Burtch poured rivulets of Fernet down the channels. 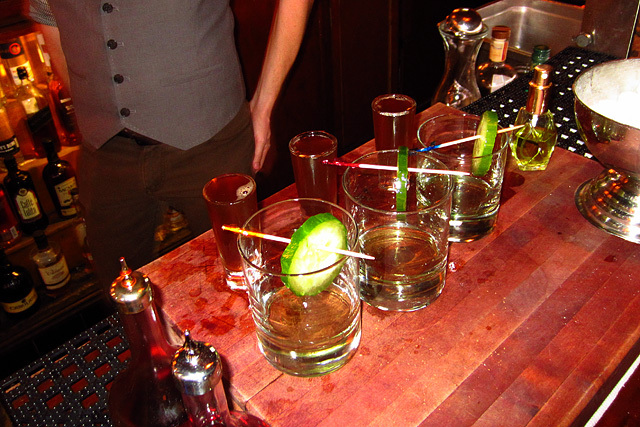 At 9pm, it was time for the finals, a single-heat “Mystery Round” that featured a Top Chef style twist: Day and Gomez were told they were not allowed to use any bar tools, and they had the option of choosing ingredients from a washtub prepared by Cole’s bar manager Brent Falco and bartender Zahra Bates. Falco and Bates clearly had some fun with the finalists by including items like string and wire hangers, along with cucumber, mint and maple syrup. Day and Gomez had about ten minutes to prepare before it was go time. Christopher Day's two-part, deconstructed cocktail. Day presented a two-part, deconstructed cocktail. The first part was a chilled shot of Templeton Rye, Fernet and a bit of raspberry syrup, which he made by stirring the ingredients in a carafe and straining with the end of a ladle. The second part featured a Green Chartreuse-soaked cucumber, which Day had cut with a spatula. Judges were told to sip the shot and then nibble on the cucumber. Edwin Gomez improvises a muddler. Gomez went a more traditional route with his variation of a Maid cocktail, featuring the Templeton with lime juice, maple syrup and muddled cucumber slices and mint leaves. 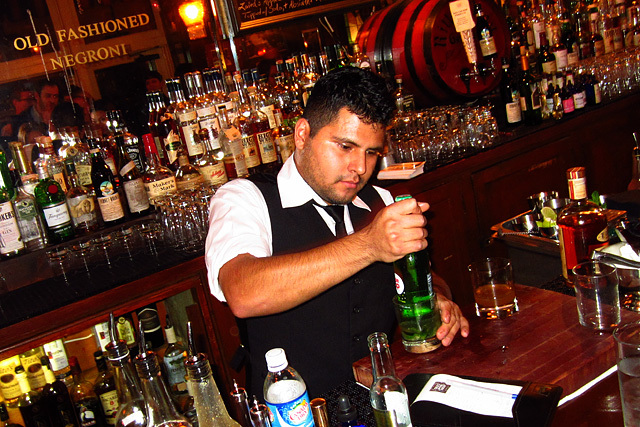 In keeping with the rules, Gomez stirred the cocktail with a big piece of ice for about a minute, then added cracked ice and a mint bundle to present his cocktail for judging. One of the judges wasn’t able to answer the bell for the final round, so I was asked to pinch hit and help determine the winner. The discussion was thoughtful and lively, and as the finalists anxiously awaited the judges’ decision, Falco was called over a couple of times to clarify the parameters of the competition. Perhaps the most helpful advice was her suggestion to include the entire day of competition when judging the finalists, as well as her reminder to consider Day’s cocktail in its entirety, not just its components. And the winner is...Christopher Day! The judges agreed that both cocktails were excellent, and each of us would be happy to order either cocktail from a bar menu. Day ultimately won by scoring extra points for taking a risk in the finals, rather than playing it relatively safe. After Falco announced Day as the winner, the party continued until midnight, when it was time to count down to Repeal Day and toast with a glass of Fernet at midnight. Congratulations to Christopher Day, and cheers to Edwin Gomez for making it such a tough decision at the end! For more photos from the 4th Annual Jimmy Barella Bartending Competition, please visit the Thirsty in LA Facebook photo album. Build ingredients in a double rocks glass with a large ice cube. Stir well and serve like an Old Fashioned, with a flamed orange peel.